The mental foramen is an important anatomic landmark located on the buccal aspect of the mandible. Evaluation of anatomical variants in the mental foramen (MF) is an important prerequisite for implant and surgical procedures involving the anterior part of the mandible body to avoid mental nerve branches injury. The most frequent variation is the presence of double mental foramen, ranging from 1.4% to 12.5%. The incidence of triple mental foramen is extremely rare ranging from 0.7% to 1.2%. 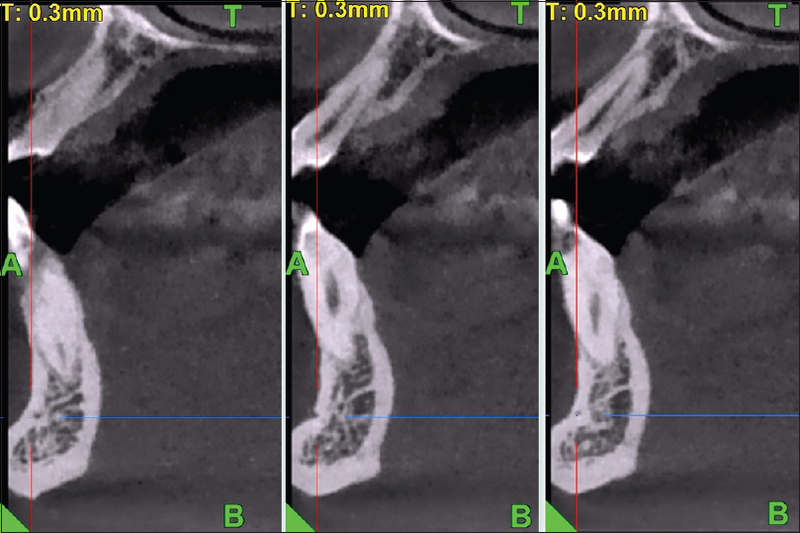 Cone beam computed tomography (CBCT) is the diagnostic tool of choice for imaging the maxillofacial region, which allows accurate three-dimensional analysis of mental foramen variations. 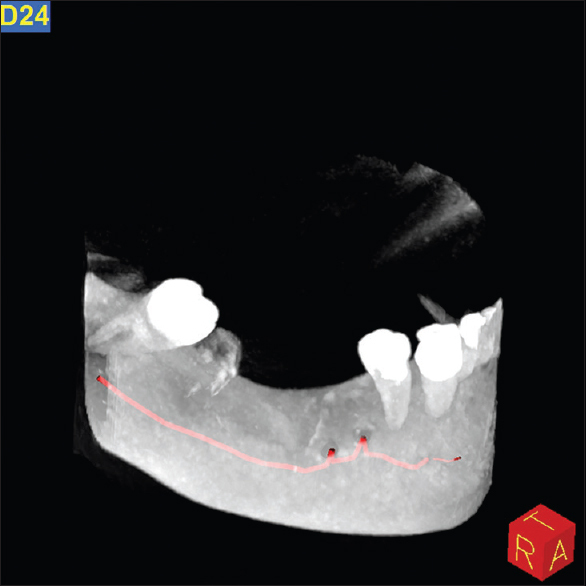 The present report describes an unusual case of triple mental foramina of the right side of the mandible in a 39-year-old south Indian male detected by CBCT. 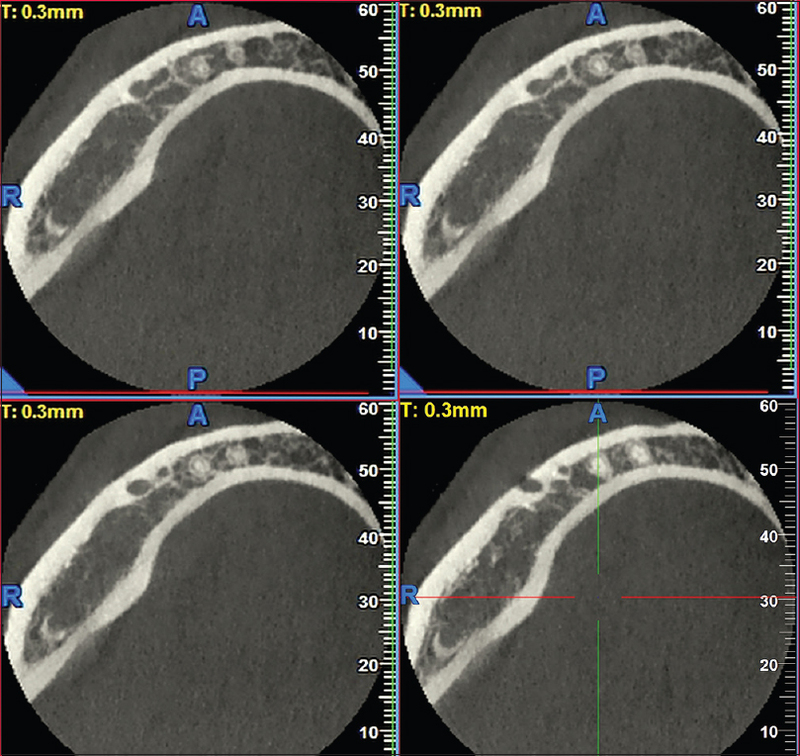 A 39-year-old male patient was examined by CBCT (NewTom GO 3D, Italy) as a part of implant planning. The scan was performed using a standard exposure and patient positioning protocol (90 kV, 2.4 s, 7 mA). The data were reconstructed at a voxel size of 0.1 mm. Triple MF was clearly evident on the right side of the mandible in cross-sectional and three-dimensional re-constructional images of CBCT. [Figure 1] shows the cropped three-dimensional reconstruction. Ovoid openings in the buccal cortex of the right mandible constituting well-defined three MFs along with nerve markings are visible. The third MF was small and distant to the other two MFs. 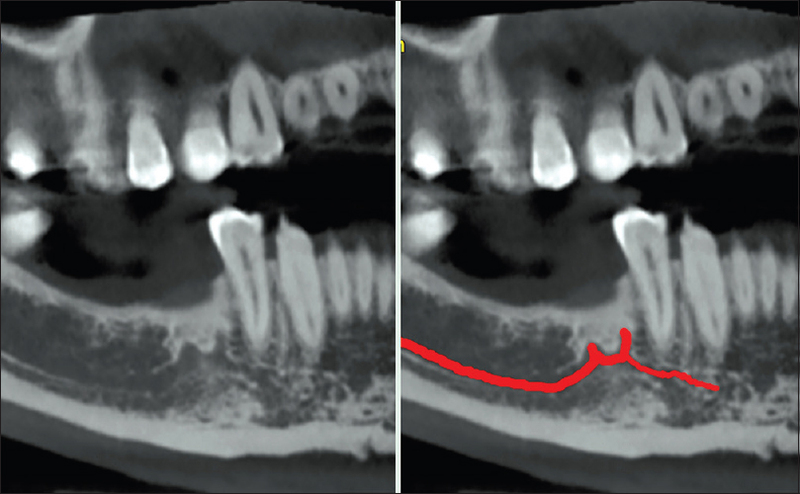 [Figure 2] shows the cropped panoramic reconstruction of slice thickness of 1 mm exhibiting the branches of inferior alveolar canal into two in the region of 45, as well as continuation of the canal anteriorly. This section proved that there was a continuation of the inferior alveolar canal from the second MF anteriorly. [Figure 3] shows axial sections with slice interval of 2 mm showing the division of the inferior alveolar canal into two MFs. Further axial and sagittal sections were reconstructed to study the anatomy of the third MF. [Figure 4] shows the axial section in the apical region of 43 exhibiting the pathway of the third inferior alveolar canal opening as third MF. [Figure 5] shows series of sagittal section in relation to 43 showing the third MF. The distance between each foramen was calculated. [Figure 6] shows the axial section exhibiting the distance marked between the first and second MF and second and third MF. Finally, the width of each foramen were calculated in sagittal reconstructed sections. [Figure 7] shows series of sagittal section showing the measurements of maximum diameter of first, second, and third MF. Precise knowledge of vital anatomical structures emerging from MF is essential in local anesthesia administration, orthodontic mini-implant anchorage, dental implants, and other surgical entities. The position and number of MFs can vary among individuals, however, panoramic and intraoral radiographs cannot always demonstrate them. Variations in the number of foramina have also been reported, with more than one MF being present on one or more sides of the mandible. These additional foramina are called AMF. In the identification of anatomical variations, it is important to differentiate an AMF from a nutrient foramen. The AMF is an opening in the bone originating from a ramification of the mandibular canal, as observed in the present case. Conversely, the nutrient foramen does not originate in the mandibular canal and its dimensions are comparatively small. In our case, there were three MF on the right side of the mandible, which was noticed during a CBCT evaluation of the bone for an implant. The third MF was at the apical region of the canine at a long distance from the other two MFs. The dimensions of the major two mental foramen were 2.3 and 1.9 mm, respectively. On the basis of other studies,, We considered AMF to be the smallest among them. 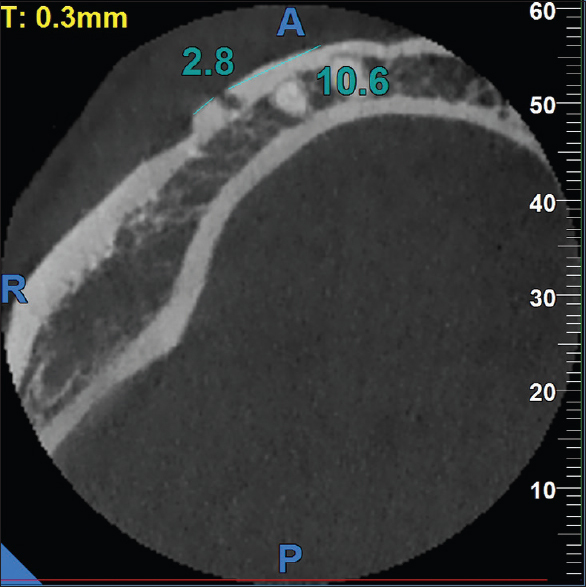 An AMF is usually less than 1.0 mm in size,, however in the present case, it was relatively wide, posing a greater risk of surgical complications in the region. The mean diameter of the MF is typically 3.0 mm, ranging from 1.8 to 5.1 mm. In the present case, both the MF were in the normal diameter range. Katakami et al. 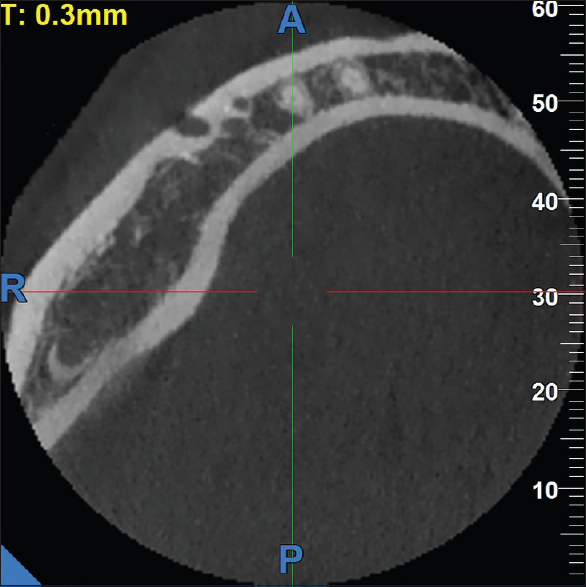 in a study of 150 patients observed the presence of 17 AMFs by CBCT, with 59% located posteriorly to the MF. Another study conducted on 157 patients demonstrated the presence of 15 AMFs, nine of which were located posteriorly to the MF., On the basis of these findings, the present study is contradictory to the literature because the AMF detected here were slightly located in an anterior direction with respect to the MF. Our case report was unique in such a way that the third MF was identified in CBCT, which was not at all seen in orthopantomogram. The mean diameter of the third MF was 0.7 mm, which was suggestive of AMF. This case report demonstrates that CBCT is a useful tool for the anatomic assessment of the MF region. It is essential to be aware of the possibility of these anatomical variations before planning surgery. Balcioglu HA, Kocaelli H. Accessory mental foramen. N Am J Med Sci 2009;1:314-5. Suman P, Singh S, Mahato RK. Accessory mental foramen-An anatomical variation of mental foramen in human mandibles. Nat J Basic Med Sci 2017;7209-14. Katakami K, Mishima A, Shiozaki K, Shimoda S, Hamada Y, Kobayashi, K. Characteristics of accessory mental foramina observed on limited cone-beam computed tomography images. J Endod 2008;34:1441-5. Naitoh M, Hiraiwa Y, Aimiya H, Gotoh K, Ariji E. Accessory mental foramen assessment using cone-beam computed tomography. Oral Surg Oral Med Oral Pathol Oral Radiol Endod 2009;107:289-94. Jacobs R, Mraiwa N, Van Steenberghe D, Sanderink G, Quirynen M. Appearance of the mandibular incisive canal on panoramic radiographs. Surg Radiol Anat 2004;26:329-33. Imada TS, Fernandes LM, Centurion BS, de Oliveira-Santos C, Honório HM, Rubira-Bullen IR. Accessory mental foramina prevalence, position and diameter assessed by cone-beam computed tomography and digital panoramic radiographs. Clin Oral Implants Res 2014;25:e94-9. Von Arx T, Friedli M, Sendi P, Lozanoff S, Bornstein MM. Location and dimensions of the mental foramen: A radiographic analysis by using cone-beam computed tomography. J Endod 2013;39:1522-8. Mihaylova H. Triple mental foramina detected by CBCT. Int J Sci Res (IJSR) ISSN (Online): 2319-7064 Index Copernicus Value 2013;6:14. Thakur G, Thomas S, Thayil SC, Nair PP. Accessory mental foramen: A rare anatomical finding. BMJ Case Rep 2011;2011:bcr0920103326. doi: 10.1136/bcr. 09.2010.3326. Kulkarni S, Kumar S, Kamath S, Thakur S. Accidental identification of accessory mental nerve and foramen during implant surgery. J Indian Soc Periodontol 2011;15:70-3. Borghesi A, Pezzotti S, Nocivelli G, Maroldi R. Five mental foramina in the same mandible: CBCT findings of an unusual anatomical variant. Surg Radiol Anat 2018;40:635-40.